How large is large enough? Specifications vary among different agencies; mass concrete is defined by most specifications based on element dimensions. Structural concrete with dimension greater than 3 feet is a commonly used guideline for determining mass concrete. The dimension for classifying mass concrete ranges from 1.5 feet to 6.5 feet. Keep in mind that the ACI specification refers to dimension only. The content of the cementitious mixture used in the mass concrete will also have an impact on temperatures within those placements. Common examples of structures often categorized as mass placements of concrete include bridge piers, footings, girders, mat or thick slabs, and structural columns. Why is mass concrete temperature monitoring so important? Mass placement temperature monitoring ensures you stay within specifications and reduces the risk of concrete developing severe cracking that could result in costly repairs or reconstruction. Heat generation occurs as the cementitious material in a concrete mixture hydrates. The majority of heat is generated in the first days following placement. This heat is highest at the center of the structure and dissipates out through the sides as it tries to reach an equilibrium temperature with the ambient conditions around it. In mass placements, because there is so much concrete flowing and cement hydrating at once, a lot of heat is generated and released, creating two primary concerns: 1) Exceeding maximum internal temperatures; and, 2) Exceeding a maximum temperature differential between the hotter and cooler part of the element. Maximum internal concrete temperature. Because heat dissipates more slowly in thicker placements than thinner ones, mass placements can get very hot. When internal concrete temperatures get high, there is an increased potential for Delayed Ettringite Formation (DEF), a materials-related issue that can lead to severe cracking. Typically, the maximum internal temperature is specified as 158°F, but sometimes as high as 160°F, because the risk for DEF increases above that temperature. Mass concrete temperature differential. In mass placements, the difference of temperature between the hotter and cooler part of the element—defined by many specifications as the core and surface—is the temperature differential. Large temperature differentials in mass concrete structures can cause severe cracking. Temperature differentials cause tensile stresses in concrete. If the stresses are greater than the concrete strength, cracking will occur. These cracks can be severe, so to reduce the risk for damage, many agencies state that the temperature difference between the hottest part of the concrete and the closest exterior surface should not be greater than 35°F. In some situations, this requirement may be too restrictive; in others, cracking may still occur below the recommended temperature differential. Every mass concrete project requires the contractor to monitor the temperature for several days after placement, sometimes even up to three weeks or longer. The temperature monitoring procedure that a contractor intends to follow usually must be described in a thermal control plan. The design calculations used in the plan must conform to the governing agency’s specifications and be developed and approved in advance of construction. A thermal control plan includes calculations for both the maximum internal temperature and maximum temperature differential the concrete element is expected to experience. These calculations are based on the size and shape of the element being cast, the mix design proposed, ambient conditions, and curing processes. The purpose of the calculations is to show the owner-agency that internal concrete temperatures will be within the specified requirements for maximum temperature and maximum differential allowed. Contractors can take advantage of advanced technology to monitor internal concrete temperatures and temperature differentials: Sensors record and store temperature data internally, while specialized equipment and software acquire and store recorded data. Specifications for temperature sensor placement vary from project to project. The thermal control plan will identify the locations where concrete temperature sensors will be placed. However, temperature-monitoring sensors should generally be placed at the hottest location of the concrete and a few inches below the nearest surface from the hottest location. Installed sensors should continue to monitor concrete temperature for the amount of time specified in the thermal control plan. After placement, mass concrete temperature readings may be acquired as frequently as every hour. After the concrete begins to cool and/or the temperature differential remains within the specified range for several consecutive days, the temperature readings can be captured less frequently. Modern sensor technology offers users the ability to define the desired time intervals for acquiring sensor data. Once acquired, the data can be downloaded into software or a mobile app and used to generate reports of temperature history and temperature differential data for easy disbursement. Some mass concrete placement projects require installation of a redundant set of sensors at locations near the primary set. Data from the former is usually only acquired and recorded in the event the primary temperature sensors fail. In that case, the contractor must seek an immediate fix. If the primary system cannot be fixed, the backup temperature monitoring system must be put into service. Failure to properly monitor the temperature of mass placements during the heat dissipation phase can result in the mass concrete element being rejected. Rejected elements usually must be removed at the contractor’s expense. To reiterate: Minimizing the risk of temperature-related damage is a fundamental part of every mass placement project. The two main temperature-related issues to monitor in mass concrete are maximum internal temperature and temperature differential. 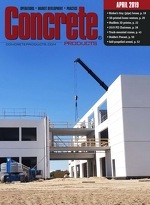 Exceeding specified limits puts concrete at increased risk of severe cracking. Thermal control plans describe the temperature monitoring procedures that a contractor intends to follow.